It’s Fortnite’s Black Knight in action figure form! Perfect for fans who think about Fortnite day and knight! Known as the Odious Scourge of Wailing Woods, the Black Knight is straight-up medi-evil! But, that’s what makes this knight dynamite! 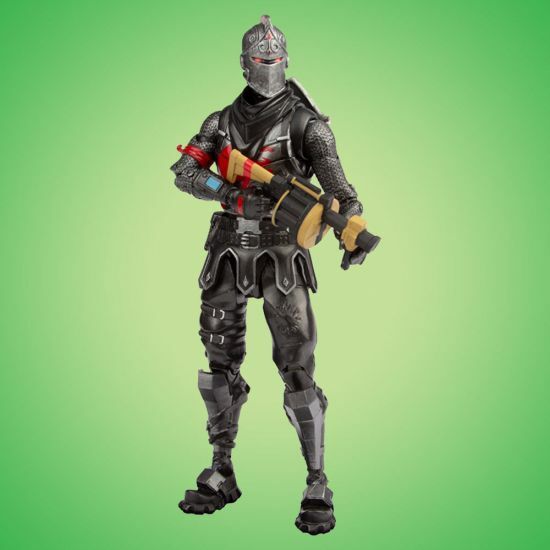 So, if you’re enarmoured with this Fortknightmare, like we are, you need this Fortnite Black Knight action figure! The toy wizards at McFarlane Toys have used screen renders from the actual game to create this action figure in a-mace-ing detail! But, not only does this Black Knight figure look more menacing than an angry dragon, he also has over 18 articulations, allowing him to pose better than ye olde calendar model. Still not convinced that this knight belongs at the head of the round table (er, you know what we mean)? Well, would the fact that he comes with an immense Grenade Launcher and his famous Axecalibur Harvesting Tool change your mind? We thought so! This Fortnite Black Knight figure will bring medieval magnificence to your shelf, desk, or display cabinet. But, don’t joust take our (s)word for it, order one today and find out for yourself!